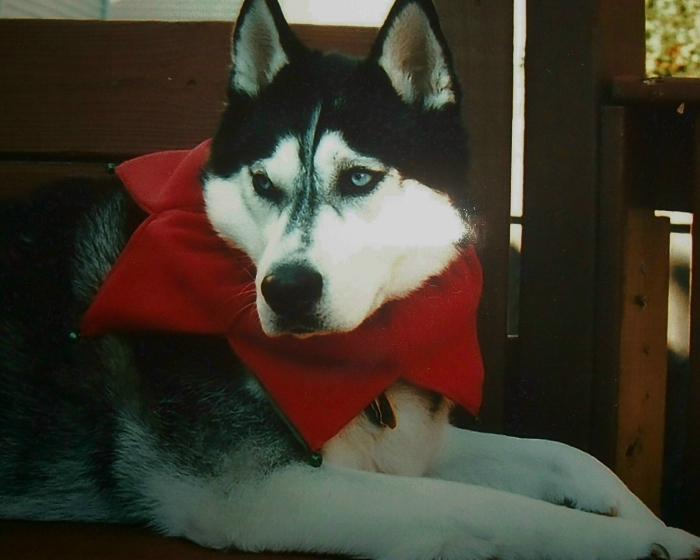 Keep your dog safe from irritating and dangerous pests with k9 Advantix for dogs under 10 Lbs. Formulated for dogs seven weeks of age and older and weighing 10 pounds and under, K9 Advantix II outperforms its competitors not only by killing more varieties of pests, but also by repelling them to prevent future attacks. The active ingredients in K9 Advantix II help keep your dog safe from ticks, fleas, and mosquitoes. 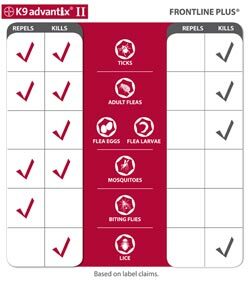 These effective compounds attack the pests' nerve cells, paralyzing and effectively killing them, as well as repelling them from future attacks. Most ticks are repelled and killed before they can attach, which may reduce the risk of transmitting disease-causing organisms to your pet. K9 Advantix II effectively kills and repels Deer ticks, American dog ticks, Brown dog ticks, and Lone Star ticks. K9 Advantix II protects your pet against fleas at all stages of the parasite's development. 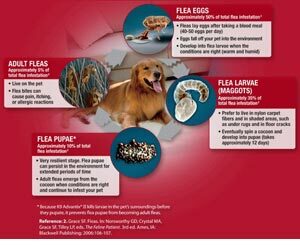 K9 Advantix II breaks the flea life cycle by killing the living fleas on your dog before they can lay eggs. 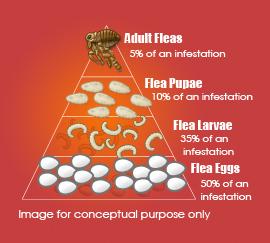 It also prevents the development of existing flea eggs, larvae, and pupae, helping to prevent future infestations. K9 Advantix II also kills reinfesting fleas (newly hatched fleas jumping back on your dog) within two hours, and it prevents fleas on a treated dog from infesting your home. In addition to complete tick, flea, and mosquito protection, K9 Advantix II also repels painful biting flies from feeding on your dog, and it effectively kills up to 100 percent of lice within one week of treatment. Box includes six 0.4-milliliter tubes of K9 Advantix II for Small Dogs up to 10 pounds. Applying K9 Advantix II to your pet is a fast and easy process. First, remove the K9 Advantix II applicator tube from its packaging and use scissors to peel down the foil. Next, hthe applicator tube in an upright position and pull the cap off the tube. Use the upturned cap to break the protective seal, and you're ready for application. If in eyes: Heye open and rinse slowly and gently with water for 15 to 20 minutes. Remove contact lenses, if present, after the first 5 minutes, then continue rinsing eye. Call a poison control center or doctor for treatment advice. If swallowed: Call poison control center or doctor immediately for treatment advice. Have person sip a class of water if able to swallow. Do not induce vomiting unless tto do so by the poison control center or doctor. Do not give anything by mouth to an unconscious person. Excellent and quality product for the best price I'v found on-line or in store. Protects your pet from fleas, ticks and mosquitoes. Great reputation and the product works as advertised. We've been using K9 Advantix II Blue for years. Never any kind of bug on either of our Goldendoodles. Sure wish I could get a product at that price, works that well, and not be greasy on my two beautiful Golden beauties. I've used this product for my boerboel for over 5 years - she's 6 yrs old and 140# - lol! It works and she has no reaction to it. Please with the shipping and Service...Also pleased in the Prices..Thank You!!! Merchant Response:Thank you for your kind words Deanna, glad we could help! I've used this particular brand for many years with great success! Have used this product for a number of years always with good results. It is easy to apply and lasts the full month. Have used it for a few months now. Not a problem. Price was good and quick delivery. ConsDo not like appying in a number of spots down the back. coat. This is a great product. I have been extremely pleased with this product for several reasons. First of all, it does an exceptional job at repelling ticks, fleas, and mosquitoes. It's worked well for her for a number of years----I wouldn't have her use anything else to repel those types of pests. Secondly, the prion diseases f being able to purchase just a 2-month supply rather than the standard 4 or 6 month supply like other pet websites is awesome!! Thirdly, the price is great, but because I was a past customer, I got a promo code to give me a discount on top of the already great price! I just can't say enough good about Entirely Pets Pharmacy online! ProsDoes keep the tick population down on the dog and helps keep them from burrowing in. ConsThe dog does not like when I put it on him and I wish I didn't have to put chemicals on him that absorb into his skin but I guess it's better than having tons of ticks on him. The ticks are terrible in the spring up in Northern WI This year I hardly found any ticks on my dog so I believe this product worked. ProsProduct seems to help keep the ticks from burrowing deep on the dog. ConsDoesn't really repel the ticks but keeps them from burrowing in deep. Also, seems to bother the dog when I put it on. I had just moved and the change of address was causing havoc in many transactions. Entirely Pets was patient and caring through all of this. It meant a great deal. I am deaf so can't use phones so we relied on emails and they hung in with me and it worked.